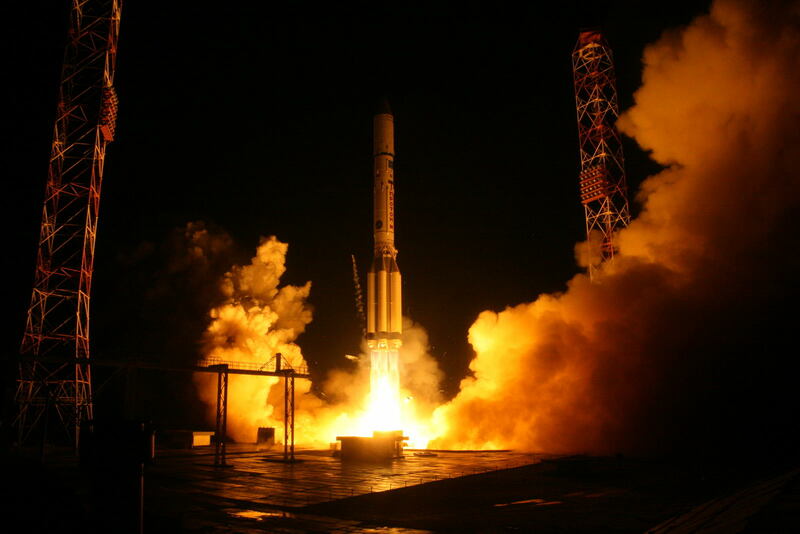 Thursday night’s Proton-M/Briz-M launch delivered the Ekspress AMU-1 satellite to its intended orbit, orbital data issued by the Joint Space Operations Center indicates. Parameters published by Khrunichev earlier in the day had put in doubt whether Briz-M conducted an accurate orbital insertion, showing a considerable shortfall in orbital altitude. 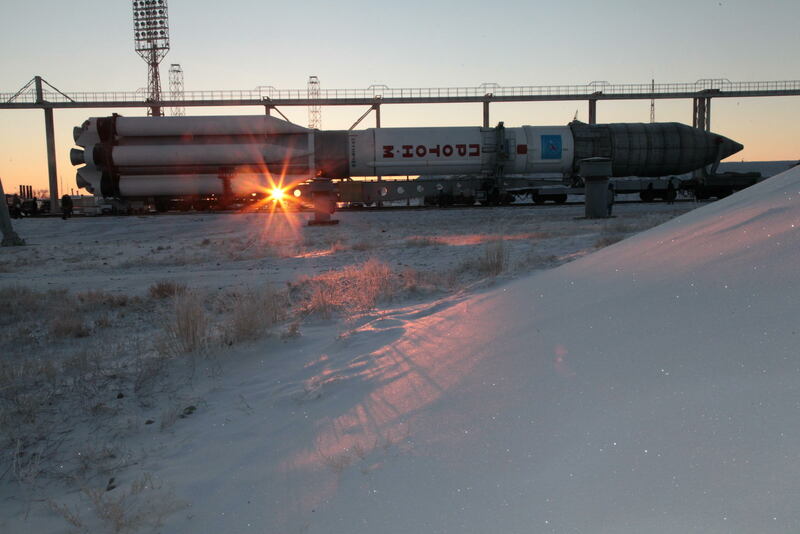 Proton-M blasted off on Thursday at precisely 21:31:18.969 UTC after a one-day weather-related delay. 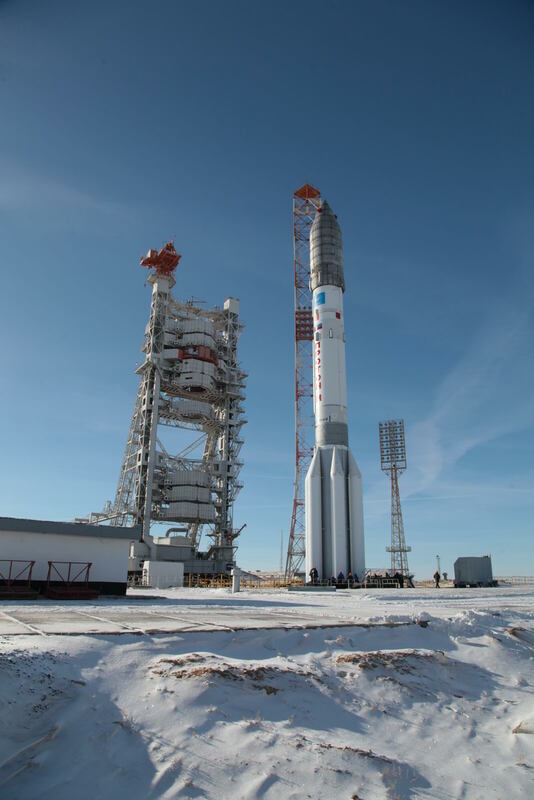 Rising vertically from its pad at Site 200/39 of the Baikonur Cosmodrome, the 58-meter tall Proton quickly disappeared into low-clouds, conducting a roll and pitch maneuver to depart the Cosmodrome on the standard north-easterly route. Delivering over 1,000 metric-ton-force of thrust, Proton’s first stage fired just shy of two minutes, accelerating the vehicle to 2.5 Kilometers per second. The four engines of the second stage, delivering a cumulative thrust of 245 metric ton-force, burned for three and a half minutes, increasing Proton’s speed to 5.5km/s and separating in the typical hot staging sequence five minutes and 28.5 seconds into the flight. Assuming control for a burn of four minutes, the third stage placed the stack on a sub-orbital trajectory with a thrust of nearly 60,000 Kilogram-force. 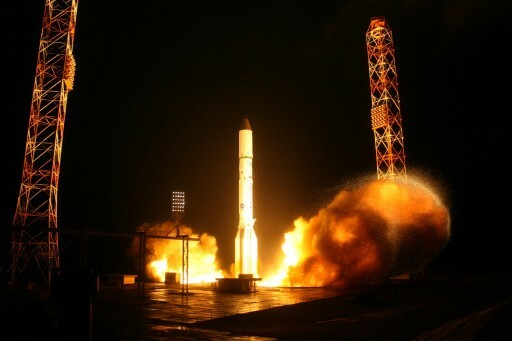 The orbital unit comprised of the Briz-M upper stage and Ekspress satellite separated nine minutes and 43 seconds into the flight to continue ascending as part of a five-burn mission lasting over nine hours. To place the stack into a Geostationary Transfer Orbit, Briz-M was tasked with an initial burn immediately after separation to enter a 182-Kilometer Parking Orbit. The next two maneuvers were dedicated to raising the apogee of the orbit to Geostationary Altitude with the high point of the orbit located above the equator. The second burn raised the apogee to 5,000 km and the third / fourth burns – conducted as a pair separated by the jettisoning of the Auxiliary Propellant Tank – aimed to raise the apogee to over 35,800 km. According to performance data, all these maneuvers were very accurate and reached the expected orbits. The final and fifth burn had two objectives – raising the perigee and reducing the orbital inclination by firing the 2,000kgf S5.98 engine of the Briz-M out of plane. 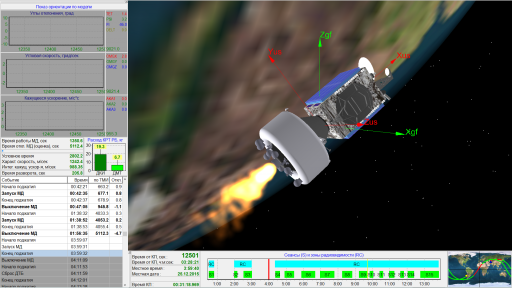 This burn was designed to bring the satellite closer to its operational orbit and reduce the amount of fuel needed by the spacecraft when making its climb into Geostationary Orbit. 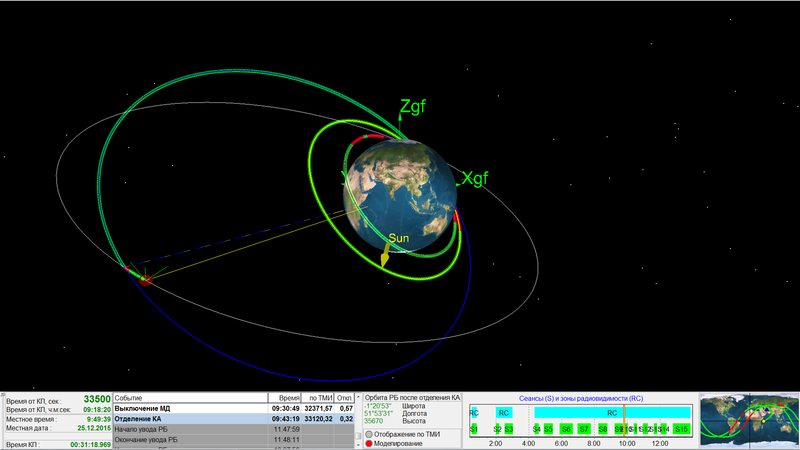 The fifth burn precisely met its expected duration and the satellite separation sequence was nominal, occurring at 6:43:19.322 UTC on Friday, right at the expected time. However, the achieved orbital parameters according to Khrunichev are 3,723 by 34,183 Kilometers inclined 22.94° while the target orbit was 4,363 by 35,793 Kilometers at a 22.5-degree inclination, amounting to a shortfall in perigee altitude of 640 Kilometers and 1,655 Kilometers on apogee. Object A should be the spacecraft very close to its intended orbit while Object B represents the Briz-M upper stage after conducting a pair of disposal maneuvers lasting 12 and 100 seconds at two and three and a half hours after spacecraft separation. 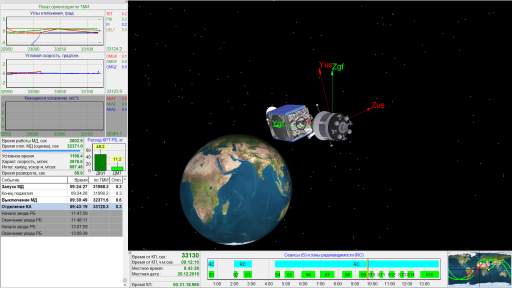 Data calculated by Khrunichev normally comes from navigation data delivered by Briz-M and ground-based radio tracking and it would seem that data got mismatched and the injection data provided by Khrunichev is a match for 82B which in all likelihood is the spent Briz-M upper stage in its disposal orbit. 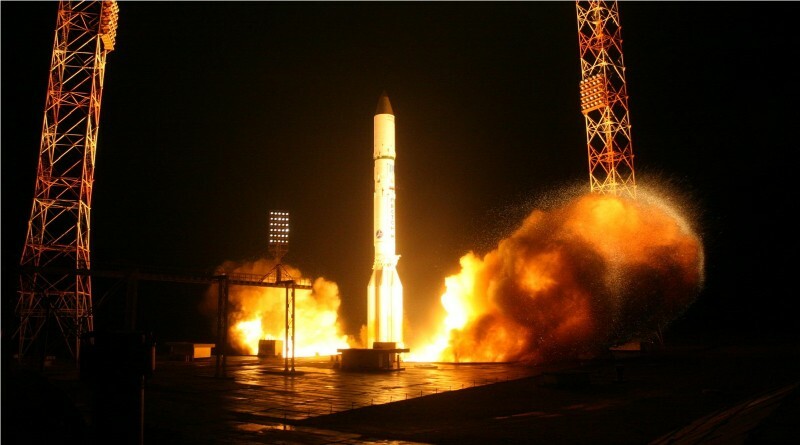 In the coming days, Ekspress AMU-1 will begin its climb to Geostationary Orbit to reach a location of 36° East in Geostationary Orbit where it will undergo several weeks of checkouts before being turned over from manufacturer Airbus Defence and Space to its operator, the Russian Satellite Communications Company. 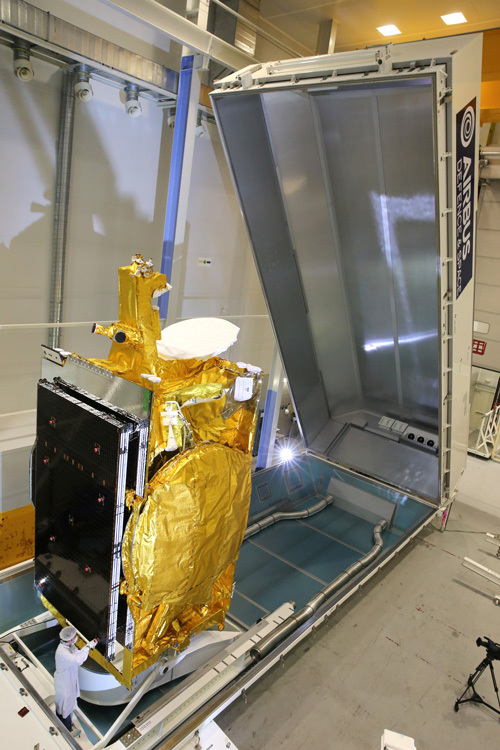 The 5,700-Kilogram satellite carries a Ku/Ka-Band payload of 71 transponders delivering coverage beams to the European portion of Russia and surrounding eastern European countries and to Sub-Saharan Africa. Services delivered by the satellite include TV and video distribution as well as IP-based applications. Residing at 36° East in Geostationary Orbit, the satellite will operate for at least 15 years. 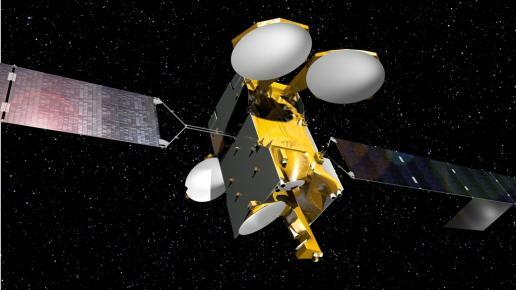 A portion of the satellite’s capacity, particularly the African beams, has been leased to Eutelsat to be marketed under the name Eutelsat 36C. Copyright © 2019 Proton – Ekspress AMU-1 | Spaceflight101. All rights reserved.